Looking for a fun and creative evening? Create-A-Craft hosts a special adults-only Collage-A-Cat class with local collage artist Perris Mackey from 7 to 9 p.m. this Friday, July 21. Working with Mackey, participants will create an original cat-themed collage using an official “Collage-A-Cat” kit. Guests are encouraged to leave the kids at home and bring your favorite adult beverage for a fun-filled night of art-making. Mackey’s pop culture-themed artwork has been exhibited at events and venues such as Ingenuity Fest, 78th Street Studios, the Waterloo Arts Fest, Wizard World Cleveland, Cleveland Bazaar, the Beachland’s Rockin’ Flea, Walkabout Tremont, Oddmall (Akron/Canton), Stella’s Art Gallery in Mentor and more. A self-taught artist, Mackey had little interest in art classes in high school. He credits his initial inspiration to watching the film Exit Through the Gift Shop, a documentary showcasing contemporary street artists, such as Banksy, Shepard Fairey, Space Invader and the polarizing Mr. Brainwash. Before discovering his passion for collage, Mackey began by painting life-size characters on pieces of cardboard and posting them on abandoned buildings and light poles in his neighborhood. Although technically a form of vandalism, Mackey says the work was appreciated by the city and residents. According to Mackey, city officials even began collecting many of the paintings when they eventually needed to be taken down. Building a fan base organically, Mackey was soon featured on Fox 8 News and in the pages of the Plain Dealer. One of his most popular pieces features portraits of the Cavs’ 2016 NBA Finals starting lineup (LeBron James, Kevin Love, Kyrie Irving, Triston Thompson and JR Smith). 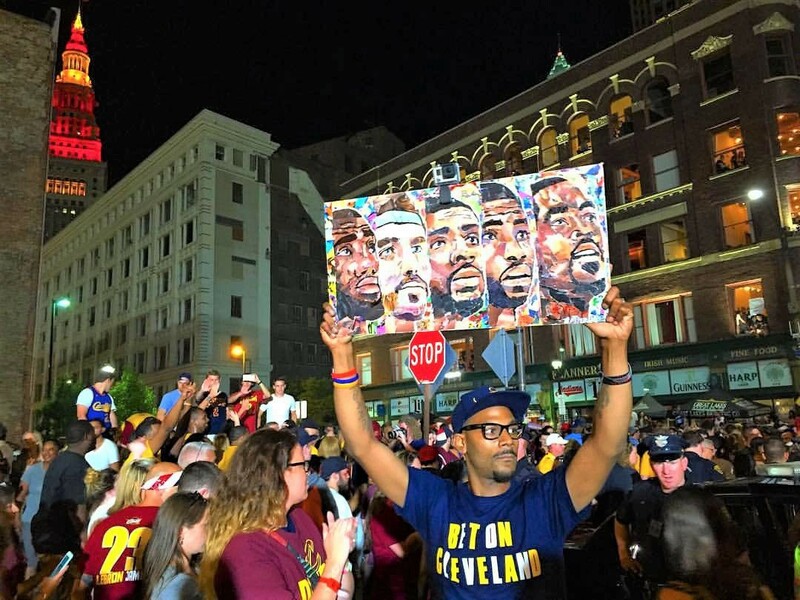 After the Cavs won the NBA Championship, Mackey even brought his collage downtown with him, both the night of Game 7 and at the record-breaking parade. Over a year later, Mackey continues to sell prints of it, as well as his other collages online and at various events and markets throughout town. Although his creative career may be relatively new, Mackey’s materials – magazines and comic books – are deeply connected to his childhood and family, specifically his 77-year-old grandmother, Rosetta, who worked for the now defunct George Klein News in downtown Cleveland. A magazine distribution company, George Klein News also distributed books, comic books, sports cards and other collectibles and products. As an employee for 35 years, Mackey’s grandmother received a discount on all the products in the company’s warehouse, which she used to bring home comics, cards, posters and more almost daily for her three daughters and two grandkids, Mackey and his cousin Bryan. 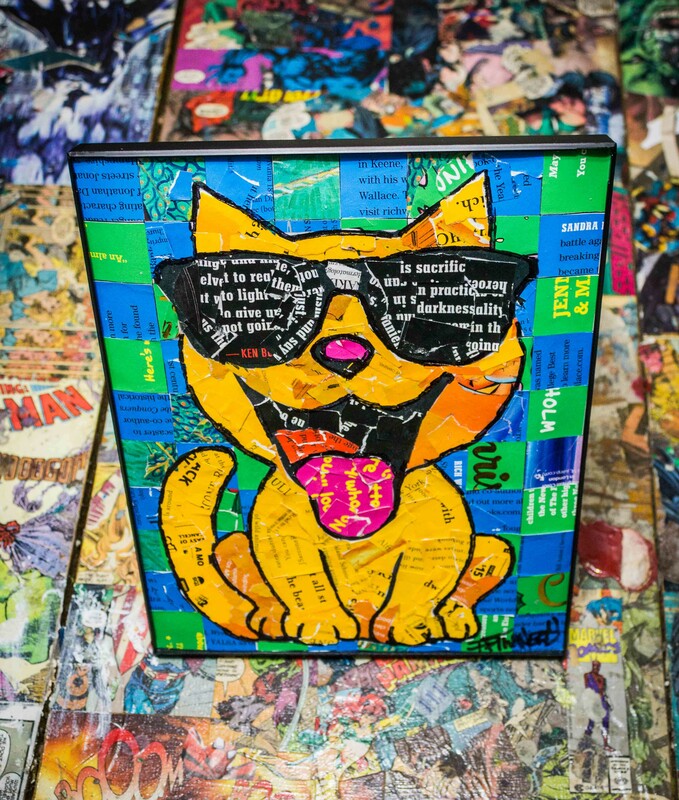 Cost of Friday’s Collage-A-Cat workshop is $35 (with discount code “earlynerd”), and includes everything needed to create a custom, cat-themed collage. The Collage-A-Cat kit is specifically designed by Mackey and his Immortal Nerd business partner and Euclid High School classmate Maestro Stevens. Originally founded in late 2015 as a clothing company, Immortal Nerd is a visual art, design and apparel company showcasing Mackey’s artwork. Create-A-Craft is located inside of Euclid’s historic Shore Cultural Centre. More than 100 years old, the building was once the original Euclid High School. Create-A-Craft is operated by Eileen Sheehan, another classmate and childhood friend of Mackey. Registration for Friday’s Collage-A-Cat class is available through Eventbrite. For more on Immortal Nerd, visit immortalnerd.com. (Create A Craft) 291 East 222nd St., Euclid, 216-505-0684, create-a-craft.com.